Sawdust City offers solid wood toy benches with lift up seats and safety hinges so the seat does not slam shut. We offer two sizes of our solid wood toy benches in two different designs. 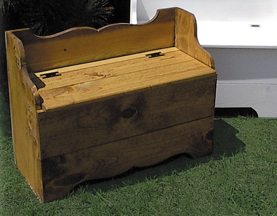 We've been making these solid pine benches since 1995 and they continue to be best sellers. You have over 40 color choices and two finishes, along with natural stains. Our toy benches make great playroom toy boxes, but they're not just for toys! Try one in the bedroom as a blanket chest, or use one in the entryway for hat and mitten storage. You can also get a toy bench custom made if there's a specific size you need.